Jarda, your doind too nice of a job on this to give up!!! As far as paint, just let this paint cure and then try to find the correct color. You already have a dark base so you could get away with some thin coats of the correct color with little build up. On the ribbed strip on the hood. I would search for some strip plastic with that rib design, sand just the rib portion on the hood, flat, overlay it with the new single piece of ribbed plastic and repaint. This is an excellent project, very interesting indeed. I would not worry about the defect in the top of the hood or the shade of paint. Just continue with what you have and finish it as is. Think of it as a personal development and this project is a step in your own development. Learn from the mistakes, methods and ideas and develop them in future builds. The basic ochre shade is spray coated. I added the dark brown woodgrain with a small piece of a fine sponge. Then I made some minor retouch with a tip of modeling knife. After that I painted the scales and knobs. Then I made the "O" rings out of 0.4mm lead wire and glued them to the dash with sidolux (future floor in other areas). I painted the rings silver with the dry brush. The black dash surround is sprayed with matt black humbroll which I polished with a soft cloth to get a dull shine of the molded plastic. Amazing dash work! You are putting a lot of detial into this build. Great job. The location of the cab is given by the mounts on the frame. The location of the engine is given by the position of the radiator. In a real truck with this type of the engine and the extended hood everything fits okay. What is wrong on the model? Can someone tell me? I think you will find that the kit radiator and cowell are not quite right for the 3408. Its a big engine and needs a lot of cooling. The kit radiator is perhaps a little thin and the cowell is flush. If you move the engine back and rework the radiator and cowell it should be OK. Check the 359 Pete below in the photo. Look at the alignment between the air breather pipe work and the compressor on the turbocharger. Also the rear of the radiator cowell and its position relative to the end of the front of the frame. keep going.you can fix what it needs..
Best wishes for the 2012. Thank you Tony and Dave for your opinions. I really do appreciate it. I thought of your recomendations and considered my abilities and decided not to make any further cuts on the frame. The idea of modifying the radiator cowling seems to be more friendly to me. Also the breather pipe work and turbocharger alignment is the decisive factor. With the pipe routing used on Clydes II the engine definitely needs to be closer to the cab. Let me start with the radiator. I combined two radiators, the one from the kit and the other from my parts box. I cut off the fan wheels of both, plain wheel from one and wheel /w a part of the cowing from the other. This added a few milimiters of thickness to the radiator. This helped to move the transmission backwards just a little bit but it is better than nothing. I also fixed the hood stripe. Using a sand paper I grinded away the damaged stripe. I scribed the grooves to a plastic stripe and filled them with the Evergreen 0.5 mm rods. The rivet details are just holes. The plane modelers use this technique to make a row of rivets. I wonder how it is going to look on a truck. Jarda good luck, I'm going build this truck soon you do very nice work, can,t wait until done happy new year!!!!!!! I extended the sides of the 5-th wheel with four pieces of plastic stripes that I cut to shape and glued them together to form two "L" channels. Then I glued them to the kit´s 5-th wheel. You can see some basic weathering made with Humbrol enamels. Also added is the locking jaw pin, the handle is still missing, as well as other details. I was critisized (in friendly way) on another forum for not having the AC compressor on my engine. 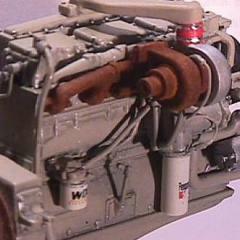 I browsed some of my CAT 3408 pics and found that some engines have the AC compressor, some others do not. I am not sure if Clydes II has one but I scratch built one and added it to my engine. I had to put the belts down but they will be back. I took the pictures early in the morning when the sky was grey and the light bulb spoiled all the colors. Sorry for that. That is same outstanding detail work. Try to find them somewhere in your area. Mine were offered by one of the local e-shops. It is a coiled metal string that holds the shape and it is easy to bend. They are black, no need to paint them.